For detailed pricing information on lab tests, vaccines, cryotherapy and nebuliser treatment, please contact reception. 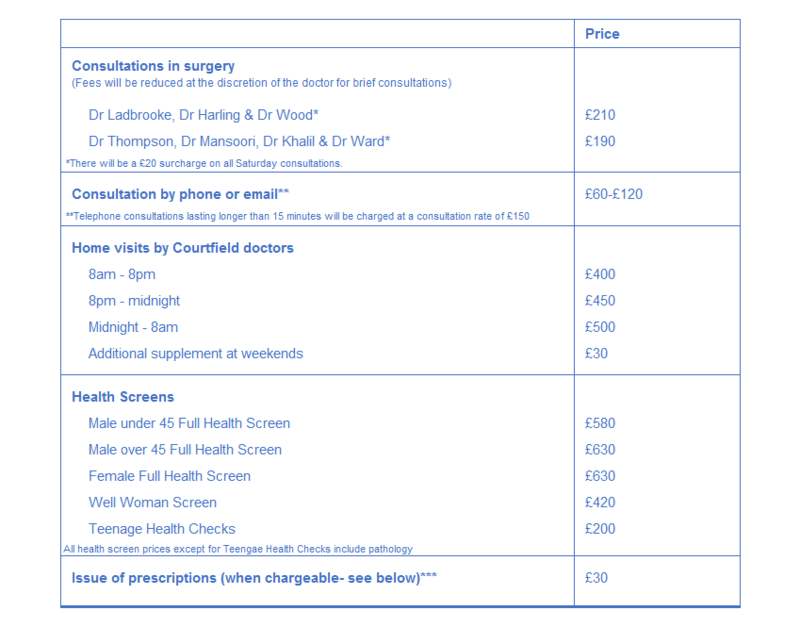 Please note: There will be a £20 surcharge on all Saturday consultations. Our membership scheme has been designed for your convenience to offer you up to 15 consultations as you require throughout the year. All administrative costs in consultation. Please note: Laboratory tests, home visits and “out-of-hours services” are not covered by the membership scheme. Your first month’s payment will be due on the day you join, with monthly payments thereafter. Our minimum membership period is one year. If you intend to leave the scheme you will need to write to the Courtfield Private Practice giving one month’s notice of your intention. It is your responsibility to notify us of any changes to your details, including change of address, telephone numbers and advising us when children have outgrown a fee band. When the Courtfield Private Practice surgery is closed, visits may be provided by our out-of-hours service, Concierge Doctor, for an additional fee. Please call +44 (0) 207 486 0701 I 0844 247 247 9 if you need assistance out of hours. Please quote your invoice number as a reference on all payments made by bank transfer. In order to facilitate the payment process, we are excited to offer a new facility which will allow patients to securely store their card details for future payments for themselves and their family. This is via Datacash (Mastercard gateway services), which is a payment processing company and one of the largest and most trusted providers of multi-channel payment services worldwide. For more information on Datacash and how we may use your card, please see the attached FAQ document below. We are proud to work closely with the insurance providers UnitedHealthcare Global, HTH Worldwide and GeoBlue to provide medical cover for their members. In order to ensure that patients are able to receive the treatment they are entitled to under their respective health insurance plans, we request that they obtain from their insurer a Guarantee of Payment in advance of any treatment at the practice. We also ask that patients bring with them their insurance card to their first appointment. Unfortunately we are unable to deal directly with other insurance providers and request that patients settle their account with us directly and claim the relevant expenses back from their insurer following their consultation. We will provide all relevant paperwork to ease the process of having your fees reimbursed. Patients on regular medication are required to have an annual medication review, either in an existing consultation or as a standalone consultation. The prescription fee of £30 is not charged for ongoing medication, as long as the annual medication review has been carried out. New medication requested over the telephone or by email will incur a fee.